On a sunny slope in the idyllic South Tyrolean mountain village of San Martino in Badia you’ll find the farm Rosshof of the Dejaco family. Lush green meadows and romantic mountains are surrounding the farm. In this magical setting you can experience a varied vacation during your farm holidays in the Dolomites. The farm Rosshof is located at an altitude of 1,550 meters in an alpine environment. Beautiful hiking trails start in the immediate vicinity of the farm. In one of the most original and colourful valleys of the Dolomites you can leave the hustle and bustle of everyday life behind and enjoy a relaxing farm holiday in Val Badia. Admiring the imposing alpine panorama with the peaks of Sas de Putia and the Sasso Santa Croce you can enjoy the rural idyll at the farm Rosshof. Life is peaceful here, and you can discover the benefits of stress-free country life. Many products are produced by your hosts on their farm. Fresh milk, eggs and seasonal vegetables are available. You may decide to actively participate in the rural life on the farm Rosshof or simply relax on the large sunny lawn behind the farm. Upon request, you may even bring your pets to the farm in Val Badia and can therefore enjoy the holidays together with your beloved four-legged friends. Comfort is king in the spacious holiday apartments on the farm Rosshof. 4-6 people will find plenty of space in the two cosy and comfortable accommodations. Two separate bedrooms provide a high degree of privacy and a fully equipped kitchen with dining and cooking utensils represents the heart of the residential units. A modern bathroom with shower and toilet is available, as well as a television. Whether you are travelling alone, as a couple or with your family, the holiday apartments on the farm in Alta Badia are comfortable vacation homes, surrounded by beautiful countryside. Your farm holidays in the Dolomites, in the unspoiled area of Val Badia, are characterized by diverse leisure activities. Beautiful hiking paths, challenging climbing tours and adventurous mountain bike trails are in the immediate vicinity of the farm Rosshof. The regions of the striking Odle Group and the mighty Sas de Putia offer excellent conditions for all kinds of activities. 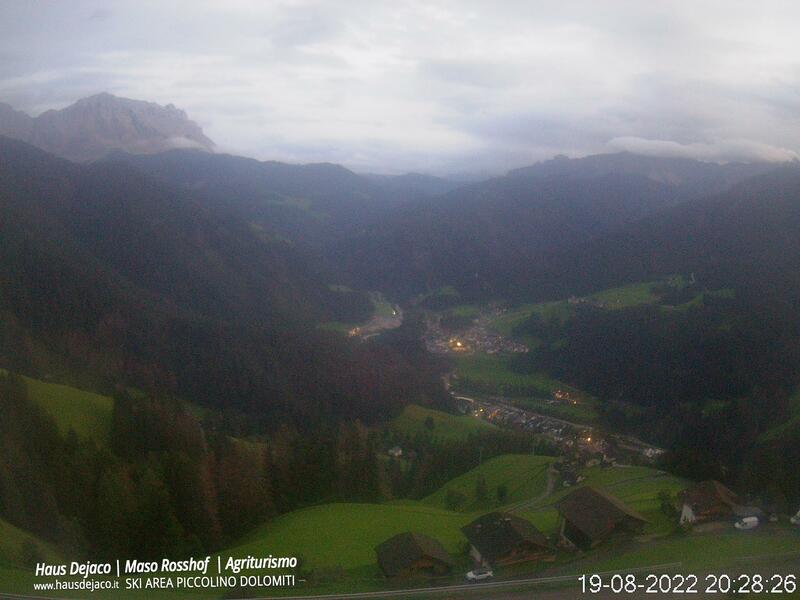 The farm in Alta Badia is only six kilometres from the centre of San Martino in Badia. The Ladin museum at the castle Thurn (Ciastel de Tor) and the old farm buildings in the alpine highlands offer charming attractions near your holiday destination.